The next major advance in the Web-Web 3.0-will be built on semantic Web technologies, which will allow data to be shared and reused across application, enterprise, and community boundaries. Written by a team of highly experienced Web developers, this book explains examines how this powerful new technology can unify and fully leverage the ever-growing data, information, and services that are available on the Internet. Helpful examples demonstrate how to use the semantic Web to solve practical, real-world problems while you take a look at the set of design principles, collaborative working groups, and technologies that form the semantic Web. The companion Web site features full code, as well as a reference section, a FAQ section, a discussion forum, and a semantic blog. John Hebeler has more than two decades of large-scale software development experience. Matt Fisher has more than fifteen years in software and systems development. Ryan Blace is a Semantic Web developer and has worked on multiple large-scale Semantic Web-based knowledge management systems. Andrew Perez-Lopez is a software developer with several years of experience with Semantic Web information systems. Part One Introducing Semantic Web Programming. Chapter 1 Preparing to Program a Semantic Web of Data. Identifying the Major Programming Components. Making Data Dynamic and Flexible. Avoiding the Roadblocks, Myths, and Hype. Chapter 2 Hello Semantic Web World. Setting Up Your Semantic Web Development Environment. Programming the Hello Semantic WebWorld Application. 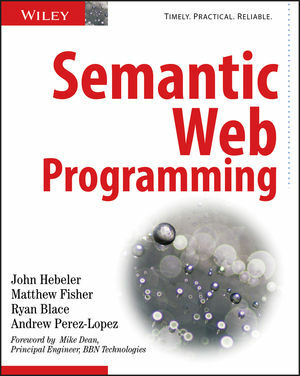 Part Two Foundations of Semantic Web Programming. Sharing Information: Syntax and Semantics. Metadata and Data in Information Sharing. The SemanticWeb Information Model: The Resource Description Framework (RDF). Terse RDF Triple Language (Turtle). A Vocabulary Language for RDF. An Ontology Language for the Web. Symmetric, Reflexive, and Transitive Properties. Functional and Inverse Functional Properties. Defining Datatypes in Terms of Other Datatypes. Equivalence among Classes and Properties. Chapter 5 Modeling Knowledge in the Real World. Exploring the Components of the SemanticWeb. Retrieving Information in a Knowledgebase. Realizing the Semantics of OWL. Choosing the Right Inference Method. Exploring the Profiles of OWL. OWL Full and OWL DL. Decoupling the Knowledge Model from the Application. Sharing across Domain and Application Boundaries. What Is a Foundational Ontology? Finding Ontologies to Reuse or Extend. Choosing the Right Foundational Ontologies. RDF Datasets, FROM and FROM NAMED. Data Streaming with OFFSET and LIMIT. Flexible Querying with FILTER and OPTIONAL. No Support for Property Composition. Mapping Friends without Upsetting Any of Them. Part Three Building Semantic Web Applications. Chapter 8 Applying a Programming Framework. Establishing the Jena Development Environment. Establishing the Knowledgebase: Setting Up the Model. Populating the Model with Semantic Web Data. Reasoning across Semantic Web Data. Deallocating Semantic Web Data Resources. Getting Information Regarding Your Semantic Web Data. Generating Events Based on SemanticWeb Data. Dealing with Concurrency and Your Semantic Web Data. Addressing the Challenges of Translation. Introducing the FriendTracker Data Sources. Exposing XML-Based Web Services as RDF. Introducing the Weather.gov XML Feed. Exposing XML Using XSL Transformations. Traversing XML Documents with XPath. Applying XSLT to a Simple Example. Processing XML and XSLT Programmatically. Applying XSLT to the Facebook Data Source. Weighing the Benefits and the Costs of XSLT. Exposing XML Using XML Bindings and Velocity. Generating Java Bindings for XML Data. Unmarshalling XML Data into Java. Introducing the Velocity Template Engine. Weighing the Benefits and the Costs. Exposing Relational Databases as RDF. Exposing a WordPress Blog Using D2RQ. Creating D2RQ Mappings for theWordPress Database. Wrapping the D2RQ Instance in a Jena Model. Querying the D2RQ Exposed WordPress Database. Weighing the Benefits and the Costs of D2RQ. Exposing Other Sources of Data. Exposing Jabber with a Custom Streaming RDF Writer. Exposing Java Objects Using Reflection. Applying the RDF Generator to the Weather.gov XML Feed. Applying the RDF Generator to the Upcoming.org XML Feed. Data Source, Domain, and Application Ontologies. Ad Hoc Approaches to Translation. Aligning Ontologies with OWL and SWRL. Aligning Simple Ontologies with RDFS. Part Four Expanding Semantic Web Programming. Chapter 12 Developing and Using Semantic Services. Chapter 13 Managing Space and Time. Space and Time in Software. Representing Spatiotemporal Data on the SemanticWeb. Spatial and Temporal Software with Jena. Chapter 14 Semantic Web Patterns and Best Practices. Exposing Data Sources as RDF. Bringing Data into the Domain Knowledge Model. Storing Information in the Knowledgebase. Initiating the Flow of Data. Unstructured Data Sources and the Client Application. LarKC: The Large Knowledge Collider. Appendix B The OWL Web Ontology Language. Appendix E Jena Reference Guide. Appendix F Installation Reference Guide.